University of Utah computer science professor Charles Hansen is part of a team that is developing new software that can help scientists visualize their work in computers with much more realism. The program, called GraviT, allows researchers to easily use a graphics method known as ray tracing to create their computer simulations with higher fidelity and photorealistic imagery. That can be an important step in helping scientists visualize their work with more accuracy. 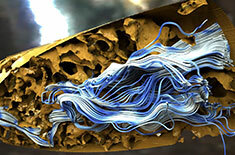 Research involving weather phenomena, blood flow through the human body, or medical conditions are just a few examples that can be reproduced in supercomputers as simulations. With Hansen and his team’s program, scientists can focus on their work instead of having to spend countless hours trying to recreate their research in a simulation through traditional methods. Work on the program also involves researchers from Texas Advanced Computing Center, University of Oregon, Intel Corporation, and ParaView, a company that designs scientific visualization software. A beta version of the software is expected to be released in the Fall. Read more from the National Science Foundation . . .